A Xmas Day hit count of 915 might not have been quite the best present ever, (that would have been my claret and blue Crystal Palace socks in 1969), but it was a surprise that so many people stopped by after attending church services and opening Santa's presents. I know the Queen came up with a good excuse to miss church, and there were a number of hits from the Sandringham area on Xmas morning, but I'm not one to speculate. Courtesy of the Sports Trader blog, I did read an interesting post on a 'biased coin' study, (Victor Haghani , Richard Dewey, 2016) which found that even when told a coin would come up heads 60% of the time, a group of 61 people managed to significantly under-perform expectations over a 30 minute period. The sample was largely comprised of college age students in economics and finance and young professionals at finance firms. We had 14 analyst and associate level employees at two leading asset management firms. The sample consisted of 49 males and 12 females. Our prior was that these participants should have been well prepared to play a simple game with a defined positive expected value. Interestingly, having heard of Kelly did not seem to help two of them: one barely managed to double his stake, and the other one only broke even after about 100 flips. 28 people managed to lose their starting stake of $25, and only 21 managed to win the maximum sum (capped at $250), significantly fewer than the the "95% that should have reached it given a simple constant percentage betting strategy of anywhere from 10% to 20%." 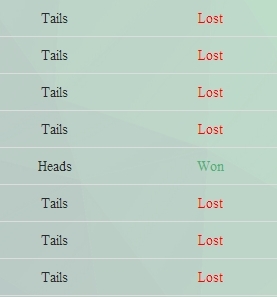 of the 61 subjects, 18 subjects bet their entire bankroll on one flip, which increased the probability of ruin from close to 0% using Kelly to 40% if their all-in flip was on heads, or 60% if they bet it all on tails, which amazingly some of them did. Betting patterns and post experiment interviews revealed that quite a few participants felt that some sort of doubling down, or Martingale betting strategy, was optimal, wherein the gambler increases the size of his wagers after losses. 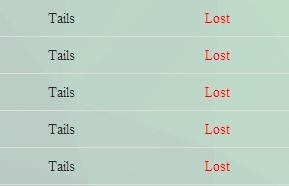 We observed 41 subjects (67%) betting on tails at some point during the experiment. Betting on tails once or twice could potentially be attributed to curiosity about the game, but 29 players (48%) bet on tails more than 5 times in the game. 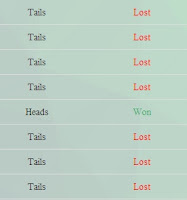 It is possible that some of these subjects questioned whether the coin truly had a 60% bias towards heads, but that hypothesis is not supported by the fact that within the subset of 13 subjects who bet on tails more than 25% of the time, we found they were more likely to make that bet right after the arrival of a string of heads. This leads us to believe that some combination of the illusion of control, law of smallnumbers bias, gamblers fallacy or hot hand fallacy was at work. Even though you won't win any real money, you can try the experiment here if you have 30 minutes of your day free, but even going in armed with a full understanding of Kelly isn't a guarantee of success! I found myself questioning whether Heads really did have a 60% probability after sequences such as those pictured, though I have no reason to doubt the claim. These results raise important questions. If a high fraction of quantitatively sophisticated, financially trained individuals have so much difficulty in playing a simple game with a biased coin, what should we expect when it comes to the more complex and long-term task of investing one's savings? Is it any surprise that people will pay for patently useless advice, as documented in studies like Powdthavee (2012)? What do the results of this experiment say about the prospects for reducing wealth inequality, or ensuring the stability of our financial system? As mentioned here many times, don't pay for financial advice - use low cost index funds and time to make your fortune! When it comes to sports betting, where our edge is typically small at best, and likely to be of limited duration, a losing run is psychologically even more devastating. One edge that shows signs of finally dissipating this season is that of the Bundeslayga System. In Bundeslayga.1 results are still positive (+6.89%), but Bundeslayga.2 is headed for a first losing season with an ROI of -9.18%. This all but guarantees that by November, Leicester City will be a top three team, Crystal Palace will be relegated, Alan Pardew will be the first managerial casualty of the EPL season, Donald Trump will win the Presidential Election by a landslide and Article 50 will have been triggered. With yesterday's announcement that Alan Pardew had been asked to stand down, my 'success rate' on the above predictions became much higher than the zero I'd expected. My lays of Leicester City are looking good, and Article 50 won't be triggered in 2016, but the others were scarily prescient, or at least too close fr comfort. Crystal Palace are far too good to go down of course, but as Palace's terrible 2016 form continued into the new season, it was hardly a surprise that Alan Pardew has 'stepped down'. They put one of their key American sports analytics specialists at his disposal but that individual found Pardew actively responded to his work once every six weeks. It is one of the unspoken rules of working for new owners that you at least pay lip service to their ideas and some rudimentary homework would have told Pardew that analytics was fundamental to Harris, in particular. As some readers will know, I was in Philadelphia last month when Crystal Palace let a 4:3 lead became a 5:4 defeat (at Swansea City) in stoppage time, and shortly after the game, a Philadelphia based (American) supporter in the pub took a call from none other than Josh Harris who, from what I could tell, was not a happy man. 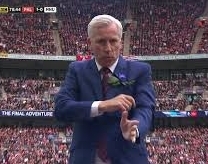 Taking the lead with 12 minutes to go was incredible, but when the big screen showed Pardew - "He's Alan Pardew, he shags who he wants" - gyrating on the touchline, I had a bad feeling. Seriously, your team has just taken the lead in a Cup Final, and rather than calm the players down, warn them of the pressure that now must come, make some adjustments etc., he's out there dancing "hey world, look at me". I thought he didn't want attention these days. Less than three minutes later, and the lead was gone. And seven months later Pardew is gone, with a tidy sum in compensation it must be said, so don't feel too sorry for him losing his job shortly before Xmas. I'm sorry it didn't work out for him - a former player and club hero is always a bonus as a manager - but it didn't work out, and a change was needed. I thought it might come after the Swansea City game next month, but now is fine with me. Time to move on. Looking back even further in the archives, I found this post on his unsuitability for the Newcastle United job back in 2010 which some of you may find interesting. I just wish I was smart enough to pay PC, maybe next year. Best wishes for Christmas and New Year, hopefully you will be around to amuse and educate us for another year and annoy those who deserve to be annoyed, Barrie. Barrie must be a new reader if he's not yet paying Premium Charges! Hopefully that will change for him by the end of next year. I have no plans to go anywhere, so prepare to be amused and educated for a little longer, and if you're out there telling porkies about how it is all but impossible to lose, expect to be called out. A bumper crop of comments on the Premium Charge discussion yesterday, and now I'm more confused than ever. When I was told that "special deals" were being given out, I assumed they were "special deals". Now I'm not so sure. So now this is only a "trial", which would certainly explain why only a sub-set of users were selected, but I'm still confused as to how Betfair could estimate my likely charges. My trading may not be typical, in that over the past two years I average just nine markets a week and a 100% win rate is not unusual, but if the total commission ends up at 50% anyway, how is this any kind of a deal? I'm no better off. Australia, for example, has rates of 6% and 8%. For those events based in Australia, your location is irrelevant. But, for Australian customers, they pay 6% on international markets. As for Bossman's rate, could it also be paid on implied commission (the Matchbook way), ie on losing bets? I was trying to explain why someone had a commission rate of 8.5% and thought it might be because other countries had higher base rates. I had no idea that some people were able to avoid the PC! Well apparently they can't - they pay the same total, more earlier (at settlement time), and less later (at Premium Charge assessment time), which would make no difference to me. I am not trying to be argumentative .. and, if we can get Bf to change PC, so that we pay less OVERALL, then, sure its a win for us. But, and its a big but ..
Bf have 10 yrs of your records. Maybe u win £100k a yr, playing in 10000 mkts. They know, based on history, the ratio of winning mkts, to losing ones. Therefore, they can calculate, what comm rate would need to be applied to your mkts, so, u pay, based per mkt, rather than weekly. If the calc is wrong, they will re-do, it .. so, maybe u get away with a few percent this mth, but, they will get it back. If u accept a 24% comm per mkt, u are hamstrung, in that u dare not lose .. as u get no relief for this. This .. to me, makes it less likely I would play a non-advantage mkt with Bf, and is why I dont see how Bf would go forward with it - at least, without some modifications. Anyway, the dialog is all good .. I do wonder, if customers in Aus/USA/other are treated equally. Maybe the argument, geographic location is different, can lead to a diff overall PC rate .. but, then, why wouldnt big PC payers, re-locate / get nominees, in foreign countries ? Yes, the dialogue is good, and no one is trying to be argumentative. Now paying less OVERALL is what I thought the 8.5% deal was all about. Not sure that is the case now. Using my example from yesterday, if I trade one market in a week, and win £100, I would pay £8.50 at the time the market is settled, yet now I hear that there would be an additional £41.50 when the weekly Premium Charge is assessed, a total of £50 (i.e. 50%). How is that any kind of a deal? As for Betfair knowing my history, I have two histories - one pre-PC averaging 15 markets a week, and one post-PC, and the markets I trade have changed - as court-siders have moved in, I have moved out. First it was Canadian snipers in ice-hockey, then golf became completely unplayable with its green-siders. Baseball was good for a while but the markets died several years ago, and the NBA has its court-siders now, but at least I get my beauty sleep, and at my age, that's important. I am far from a defender of Bf, but, I think this is a bit of a storm in a teacup. I was on a rate .. of 12% for a trial period, but, Bf then found, I was overall paying less, so quickly wanted to change it to 22% per mkt, which I declined. I got the 'trial' rate, by moaning .. which is a fair tactic, in life. This was over a yr ago - and maybe Bf will introduce changes to PC next yr, but, I am only expecting it to change the way its collected, not, the amount its collecting. I must say the Bossman has lost me there. How can paying a flat commission on each market of 8.5% result in “no overall change in the amount you end up paying Betfair” versus paying, in my case, a Premium Charge resulting in 50% of my profits being deducted? For example, if I trade one market in a week, and win £100, I pay £5 at the time the market is settled, and an additional £45 when the weekly Premium Charge is assessed, a total of £50 (i.e. 50%), which is a lot more than had I paid £8.50 (8.5%) at the time the market was settled. Even the 12% or 22% mentioned at market settlement would be a huge improvement. The way that Super Premium Charges are calculated, at least for most (although I’m beginning to wonder) of us, is that any profits in excess of our lifetime allowance of £250,000 are taxed at 40%, 50% or 60% depending on how we achieved that allowance. If we got there with a low profit to loss ratio, the penalty is lower than if we had a near 100% winning record, as would be the case with the court-siding syndicates. For every £1 I win, I give 50p back, typically 5p at market settlement and 45p on weekly assessment, and if I have a losing week, there is no refund (although the Premium Charges are mitigated until a new 'high' is reached). So given the method used for calculating the Premium Charge is based on past and known results, how can a change in the way it is collected (per market) ever result in the same amount being collected? Am I missing something? If I have a losing week, I’d still be charged commission at 5%, 8.5%, 12% or 22% (this is getting complicated) on any winning bets, and if I have a winning week, I’d be paying much less overall, but there’s no way that Betfair can see into the future and know what my results might be. As for the comment that “moaning is a fair tactic in life”, I’d agree this is acceptable in a competitive market, but Betfair is a de facto monopoly - the term used when more than 70% of an industry is serviced by one company. If I want to fly to Philadelphia, I have a number of options available, and if I don’t like British Airways prices I can shop around. When Southern Rail set out their fares for my commute into London, can I moan and expect to get a special deal? I can certainly moan, but I won’t get a special deal, and I wouldn’t expect anyone else from the general public to receive a special deal either. If special deals are available, they should be published for all to see. The more voices that are raised regarding this issue, the better. It may be a "bit of a storm in a tea cup" to the Bossman, but paying 50% in taxes when my competitors are paying 8.5% (or 12% or 22%) is more of a tsunami to me. Does anyone know how long the special deals have been available for? Doesn’t Bf charge different amounts of commission in some countries? I believe this is the case, and they may also charge different rates of commission on different markets, but I’m not sure how this is relevant to favouring some Premium Charge payers over others. Presumably regulatory factors account for different rates in different jurisdictions – the cost of doing business (i.e. taxation levels) is not the same in all countries, and the differences are much smaller (5% versus 7%) than the 8.5% versus 40% (or more) we are talking about with Premium Charges. This may no longer be current, but at one time 7% basic commission was charged in Albania, Armenia, Croatia, Monaco, Serbia & Montenegro and Slovakia - but who wants to live in a country or principality that ends in a vowel? I took a few minutes last night to email the Competition and Markets Authority with some observations on Betfair's Premium Charge, and encourage you to do the same if you are similarly affected. 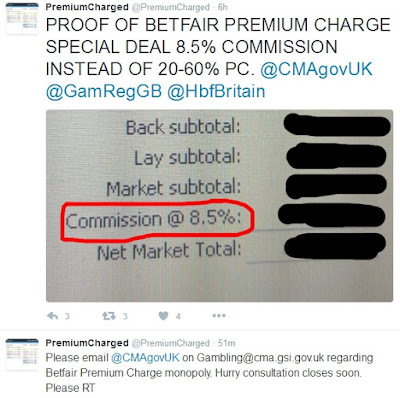 Good news that people are raising the matters of discrimination in PC charging by Betfair. 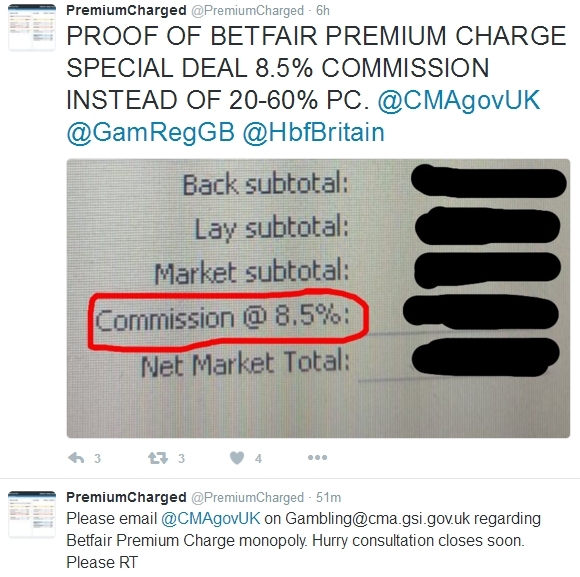 I think that anyone who has an interest in the matter should look very closely at @premiumcharged twitter where there is other evidence of serious differences in how Betfair treat their customers. Also @denis_mikan and @kingkauto1 have relevant material. The BHA HBF Forum is lucky that they have Mr Scott Ferguson @borisranting who is a former senior Betfair employee. He has full knowledge of all the special deals and will no doubt be advocating on behalf of punters. Scott Ferguson is a familiar name of course; the other names mentioned, not so much, but I'll check them out. It's important to know why some customers are apparently being given an advantage over others, and if Betfair are encouraging the court-siding syndicates run by former employees to the detriment of the majority of their customers, it's a story that might interest a budding Michael Lewis. Trader247 suggested that the 8.5% commission could be a low value win (which means that rounding produces some higher market commission rates as shown below) but if you read the @PremiumCharged timeline, you'll see evidence that others have been offered the 8.5% deal. I'm sure you'll correct me if I'm wrong but the screen shot of Commission being charged at 8.5% is from an individual market and has nothing to do with PC. As you're aware PC is calculated on weekly profit not individual markets and is never presented in this way. Sorry I should correct myself, PC is charged on lifetime profits but calculated weekly. Lee is correct that Premium Charges are charged weekly based on lifetime profits, but the allegation is that some PC payers are being given the option of a flat 8.5% commission rate charged on each market in the same way that commission was charged prior to September 2008. @PremiumCharged asked me to clarify my rate and whether I had ever been offered or asked for a special deal, and the answer is that I pay 50% and have never been offered or asked for a special deal. Again, if you are affected by Premium Charges, take a few minutes to write to the CMA. You have nothing to lose but a few minutes of your time. The most famous loss recovery process is the good old, double after every loss, ‘martingale‘ system. The problem with all these systems is that they ultimately fail. Who knew? I shall keep the writer's name to myself and spare his blushes since his openly low opinion of his readership's intelligence probably isn't going to help sales of his training classes. Sadly James deleted the post for some reason, (one hopes it was not as a result of any threats), but bounced back with a new one today "The Management Would Like A Word" comparing the world of Victorian medicine, snake oil salesmen, charlatans and quacks with today's unregulated betting world of e-book writers, trainers and tipsters. Business is business. Vendors have product to shift and need to protect the message, the message that trading is not hard and anyone can succeed. I have just one aim on this website, to tell the truth. On this website I will tell you how hard it is to trade and that most will fail. A vendor will sell you some software and a training course with no caveats. The majority have to fail in order to compensate the lucky few who win large sums through skill or through luck. Because my message is different there are those who feel I should be silenced. After all, who is going to buy miracle cures if the salesmen admit that most of their cures don't work and any that do only cure a few. Who indeed? Certainly no one with the ability to understand that in a zero-sum game it simply is not possible for everyone to be a winner. As for someone "wanting to have a chat", this sounds a little threatening, something I've had to deal with myself in the past. Unlike James, I have nothing to sell - no service, no books (yet), no courses - so I can be completely impartial, but James nevertheless calls it like it is. I don't see him saying "buy my book, and financial success is guaranteed" even though that would likely boost sales! I have yet to read his latest book (it's on my Xmas list), but his blog is refreshingly honest and it's sadly not surprising that he's apparently ruffling a few feathers. "Clearly there is a problem somewhere because there are never any comments on Peter's blog. It would be great if it could move to a moderated format like Cassini has done." I've never commented on Peter's blog but plenty of my comments have never appeared on cassini's either, maybe it must be my internet connection? ...comments which I feel don't add a lot to the conversation. I checked the comments awaiting moderation and unless Robbo the trader posted as "Anonymous", there is nothing there since January 2014 when I switched to the moderated comment format to avoid the rubbish above. If Robbo has the details on what posts he commented on, I can check, but to the best of my knowledge I have never declined one of his comments. Perhaps he was being a little tongue-in-cheek. Occasionally there are comments which are not intended for public viewing, and this request is respected, and the occasional comment selling something or requesting a link swap is ignored because I'm simply not interested. Although I monitor my hit count, that's because I love my numbers rather than because it matters. It makes no difference to me if I get one hit or comment or a thousand hits and comments. I get emails offering help on "increasing sales" but I have nothing to sell. I don't care, which is why I write what I want to write. Writing this blog is purely a hobby - consider yourselves lucky I didn't choose to blog about my 30,000+ collection of pre-1940 postcards! Whilst it is gratifying that Mr Webb reads my every word, he doesn't seem able to understand the concept of scaling. His latest blog article shows a limited linear approach to scaling. i.e. if you have more money then you increase your bet size. But this is not scaling, this is just correct money management. If you follow Kelly criterion to the letter, a successful trader always chases winnings and never chases losses. As a bankroll increases so too must trade size in relation to edge. If there is a run of losses and the bankroll decreases then so too must trade size. That is all that the befuddled Webb is saying, which has nothing to do with scalability. In my latest book, Betfair Trading Techniques, I put forward the analogy of a shopkeeper running a 9 to 5 business. The only way the shopkeeper can scale up income in his hands-on business is to work harder or work longer. This is analagous to the manual trader trading more markets per day or trying to turnover more money in each market thus risking market capacity problems. In a way, it sums up quite neatly why my own trading has declined in importance over the years. Although 2016 isn't over yet, trading profits are likely to be around 3% of net income. Looking back at 2009, and they were closer to 17%. The Super Premium Charge has obviously had a big impact, as well as the more welcome increases in my day job salary and in investment income in the intervening years. As James points out, for a manual trader like myself, it's hard to scale up. I have fewer hours available than used to be the case, and moving into more markets isn't an option because I can only trade one at a time. Hence the increased use of less time consuming 'bet and forget' systems, but even those take time each day. The ‘finishing line’ of £250,000 may sound like a lot of money, but as Mr. Mark Iverson discusses in this post, when you think of it as total income generated over a number of years, it certainly isn’t. The latest figures available show that the median gross income for men in the UK is £538.20 a week (£28,000 a year rounded). Regional differences mean that the top median is in London at £36,000 while the lowest is in Northern Ireland at £24,000. After deductions, this works out at £21,402, and to reach £250k would take 11.68 years. Betfair was launched a little over 11 years ago – in early June 2000. Coincidence? Well, yes, probably, but the point is that a Betfair customer making an average income on Betfair would be hitting the £250k mark in the next few months. As a part-timer, the changes are annoying, but given that anything I make is a bonus, it’s not life changing. I am unlikely to match my current averages, but life is about adjusting to changes, and in the whole scheme of things, it doesn't, or shouldn't, rate too highly on ones list of priorities. It’s the full-timers on median income or thereabouts who will feel the most pain. After netting 95% of gross winnings before the Premium Charge, and 80% of gross winnings since, some now face the prospect of netting just 40% very soon. Assuming that full-timers are pretty much already maxing out their potential, to face a halving of income may well be the death knell for some. Not surprisingly, many traders have subsequently left Betfair. The inability to scale (see James Butler for details, not Peter Webb!) meant a significant reduction in income and if it is your sole or a major source of income, you need to move on. CMA Gov is the Competition & Markets Authority. Write to them at Gambling@cma.gsi.gov.uk and let them know your thoughts on the Premium Charges, how they were introduced, how they are implemented, how they are anything but opaque, how they favour certain (new) customers over others (longer-term), and perhaps why they were introduced - your experience of court-siders perhaps, the evidence that former Betfair management were behind court-siding syndicates. What commission rates are those former employee accounts charged at? I think I'll make it a New Year's resolution to stop reading his blog. I don't mind reading waffle to find the occasional nugget, but I can't recall a nugget there. Peter's reason for blogging isn't that he is interested in sharing any nuggets, but in making money. His blog promotes his software and his trading classes, which is quite reasonable for him to do, because it's his business. Sales of either are not going to be promoted either by giving away nuggets, and thus obviating the need for his services, or by telling the truth, which is that trading is a zero sum game, with most participants eventually losing. Far more profitable to say how easy it is without explaining how it is possible for everyone to be a winner. My confidence was lifted with a really good trade to start. Does anyone else see something rather strange about that statement, coming as it does from the greatest sports trader the world has ever known? Most of the entries I have read on the Betangel blog are written in riddles, presumably designed to generate interest in his product. Clearly there is a problem somewhere because there are never any comments on Peter's blog. It would be great if it could move to a moderated format like Cassini has done. Turning to the financial markets, and Peter's self-serving approach is similar to that of Active Fund managers not telling you that you have a 99% probability of doing better by investing in Index Funds than with them. They make their money from people having an unrealistic expectation from Active Funds. According to the analysis, 99 per cent of actively managed US equity funds sold in Europe have failed to beat the S&P 500 over the past 10 years, while only two in every 100 global equity funds have outperformed the S&P Global 1200 since 2006. Almost 97 per cent of emerging market funds have underperformed. As with many things in life, caveat emptor, and don't believe the hype. If a blog is linked to a product or service, it is unlikely to be impartial or completely honest about likely results. I mentioned yesterday the "bloggers, web sites, tipsters and betting clubs out there who would have you believe that making a fortune from betting is as easy as opening an account and getting started" and each of these have their reasons for doing this. I realise that I’m pretty unique, in that I can trade confidently at pretty much any level. Despite the repetitious use of the word 'pretty', it's not a pretty sentence at all. Leaving aside for a moment that there are no degrees of uniqueness - something is either unique or it's not - that's an interesting, if not very modest, statement. At 'any level' is of course subjective, but one of the limitations of sports trading versus trading in financial markets, is that the volume is relatively low. One might expect such a Trading Titan to be flexing his muscles in the more lucrative financial markets, rather than piddling around with the 2:10 at Ludlow. Not many Betfair Exchange markets let you risk more than four figures at the best price, so there are really not that many levels at which one could be trading confidently. Peter's interest in preaching the message that 'anyone can do it' is that he has a product to sell, and telling novices that they are unlikely to succeed isn't going to lead to big sales. However illogical it is, the idea that everyone can be a winner is far more palatable. It's also interesting to note that the Premium Charges that Peter is presumably liable for, haven't been mentioned since 2011. It's curious that the impact these charges have on trading aren't discussed, though perhaps warning people that they might win too much and have to pay a charge in the future, isn't good marketing! Unfortunately, intense scrutiny isn't the hallmark for many things related to most 'get-rich-quick' schemes, which is why anyone thinking of turning to trading as anything but a hobby should read articles and books by the likes of Joseph Buchdahl and James Butler before jumping in, and not allowing themselves to be influenced by posts and comments from those with an agenda. Finally, if anyone has any suggestions as to where Peter might put his excess capital, let me know. The winning entry will receive a free subscription to this blog for 2017! Has anyone else noticed the rather confusing way in which Betfair shows the scores of the NBA fixtures? An opportunity for improvement, one might say - our Premium Charges at work. Another mug reporter caught out by survivorship bias. For every successful millionaire on the extreme right of the distribution of wealth there are many more scraping along and many doing worse. I see survivorship and confirmation bias everyday in sports and financial trading. There has to be many losers to pay for the one big winner. If everyone was a winner then we would all be losers minus commission. The paradox of skill as Buchdahl calls it. The better we all become as traders, the harder it is to profit and luck takes precedence over skill. Take commission from that and you are left with a loss. If you can't see why then you need a new hobby. For any readers not familiar with my dry sense of humour, the post wasn't intended to be taken too seriously. Anyone earning a median salary would become a millionaire in less than 40 years simply by working 95 hours a week and saving 15% - it's called the power of compounding - but why work hard and save when you can "comfortably double your money in the space of a year" simply by signing up with a few good tipster services? The suggestion to "spend 55 hours a week trading - there are plenty of sites out there saying how easy it is to win all the time" was very much tongue in cheek, and a gentle dig at all the bloggers, web sites, tipsters and betting clubs out there who would have you believe that making a fortune from betting is as easy as opening an account and getting started. Betting is a great way of investing money, but that short sentence above in italics (if done properly!) is an extremely important proviso. I don’t personally know of a better investment vehicle than betting but only if executed properly, in a way that minimises risk and maximises potential returns. I guess the biggest benefit is that the potential returns are so good. For a strong, well-balanced portfolio of tipsters, returns should see annual bank growth of somewhere between 60 and 120%. What other investment can comfortably double your money in the space of a year? Really? 60% to 120%? Comfortably double your money in a year? It's that easy? My friend Steve "Holiday Hamper" M doesn't seem to be finding it that easy, and if anyone knows about finding strong tipsters, it is surely he. The truth is that good tipsters are hard to find. Skeeve comes to mind as an exception, achieving an edge by specialising in a niche market, but most others have no edge at all. For any that do have an edge, it is an edge that will erode rapidly once they start publicising their selections. I believe it was James who said that an edge shared is an edge eroded, or words to that effect. Betting is a fun activity with a small amount of money, but the fun lies more in the intellectual challenge of beating your opponents than in the profits themselves, and it's unlikely to ever be an 'investment' whatever anyone tells you. Ten to fifteen years ago, when the exchange concept was relatively new and court-siders and the Premium Charge didn't exist, it was possible to make a good second income from betting / trading but the markets have evolved as you would expect them to. It's not that easy now. Back to football, and while I'm not a big fan of tying my money up for a full season, I have had a few bets matched laying Leicester City in the Premier League this season, including for a top 10 finish at 1.46. I suspect that Leicester City's bubble has burst, and with the added distraction of Champions League football and a key player departing, can see them struggling rather like Ipswich Town did in their first season (17th of 22 teams) after surprisingly winning the League. And struggling they are, currently 16th of 20 teams and very much 'doing an Ipswich' with more than a few Champions League group runners-up hoping to draw them in the knock-out stage I'd suggest. While a seven figure net worth isn't what it used to be, and easily achievable with a steady income and some financial discipline, it still makes a good magazine headline or book title, e.g. The Millionaire Next Door, Milllionaire Habits In 21 Days, Millionaire By 28 (OK, so that one might be a little ambitious) but you get the idea. Grant Cardone didn't always have millions in the bank. At age 25, he was deep in debt and stuck in a sales job he hated. The entrepreneur, who owns and operates four companies that do nearly $100 million in annual sales, reached seven-figure status by putting in more hours, he writes on Medium: "Most people work 9 to 5. I work 95 hours (per week). If you ever want to be a millionaire, you need to stop doing the 9 to 5 and start doing 95." He's not the only self-made millionaire to say that the steady salary that comes with a 9-to-5 job is holding people back from getting rich. Average people choose wages based on time — an hourly rate, for example — while the rich are typically self-employed and get paid based on results. "The masses almost guarantee themselves a life of financial mediocrity by staying in a job with a modest salary and yearly pay raises," Siebold writes. They "wait on the sidelines, terrified to get in the game for fear they will lose the little money they have. Meanwhile, the world class is earning more in a year than the average person will make in a lifetime." If you want massive success, you have to focus on earning and be prepared to grind, Cardone says. And once you do start seeing financial gains , don't change your mentality: "If you gave me $5 billion, I'd still be grinding tomorrow. "My life is not in the stands. My life is not as a spectator. My life is being a player on the field." Remember, "there's no shortage of money," Cardone writes. There's just "a shortage of people doing 95 hours each week." While most long-time readers of this blog will already have achieved millionaire status, or at least should have if they have followed my advice, for any newcomers wishing to speed up making their first million, it's simple. Philly was chilly, but not bitterly so. 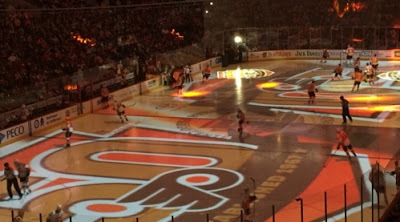 As some of you will know, the live sporting highlights were a Sunday night Flyers v Calgary Flames (ice) hockey game, followed by a Monday night (American) football game between the Eagles and the Green Bay Packers. Two more entries to check off in my I-Spy book of Sports Venues. My son and I did consider going to the 76ers v Cleveland Cavaliers game earlier on the Sunday, but decided to save that one for February or March. For the Thanksgiving weekend we ventured down to Washington DC, followed by a trip to see relatives in Maryland. The highlight of the DC trip was my son getting lost for about seven hours, his sense of direction taking him on an adventure which ended when he arrived back at the hotel at 5am. One minute he was with me about to enter a steak house, the next he had vanished, and with both our phones dead, no way of getting in touch. How did people manage before cell phones? The bar bill for the pre-dinner drinks for the two of us came to $137.74 (£108.22) which may go some way to explaining the mix-up. Considering that was all beer, and in an unpretentious sports bar, that was apparently quite a session. We also had a couple of good Saturdays in a downtown Irish pub (Tir Na Nog) watching Crystal Palace lose and the Rugby Autumn Internationals. At least one reader will recognise that pub name, having met me there during Palace's summer tour of the USA. It's a small world. Philadelphia has a large Irish community, and there were a lot of rugby followers for the Ireland games. Quite a few people I spoke to had been in Chicago for Ireland's famous win over the All Blacks there a couple of weeks earlier. In fact, it was so much fun I plan to go back there for the weekend of what should be the Six Nations decider on March 18th in Dublin. Despite the lack of new posts, the blog has averaged over 300 hits a day during my absence, which is a little surprising. Now I'm back, I expect that number to decline significantly, but 1.4 million by year end is looking probable. The College version is performing slightly better, but both have been strong systems so far this season. Early days still in the NBA season, but the BLUnders is not off to the best of starts with just 8 wins from 20 so far. The Golden State Warriors v Phoenix Suns game tonight has the highest total (229.5) of any game this season other than a couple of Warriors v Lakers games. The Lay Last Loser System for this 2015-16 season came to end today with Tottenham Hotspur's thrashing of Swansea City, meaning that three of the five qualifiers won immediately, and thus we took a small loss of 0.7 points on the season.